Nathan Shaw - a "fine young man on the threshold of his life"
A teenage football hooligan who killed a rival supporter after smashing a pint glass on his head has been sentenced to seven years in youth custody. Preston Crown Court heard Andrew McNee was a member of a group of Burnley fans - nicknamed the Suicide Youth Squad - and the victim was an "utterly blameless" youth. Nottingham Forest fan Nathan Shaw, 17, was attacked by McNee outside a pub in Burnley town centre before the Division One game between the Clarets and Forest last season. The attack happened in St James's Street, close to Yates's Wine Lodge. He managed to stagger away, but later collapsed and died in hospital, with his family by his bedside. McNee, 19, of Osborne Way, Haslingden, Lancashire, had been charged with murder, but pleaded guilty to manslaughter. In a letter to the judge, Mr Justice Leveson, McNee said he felt genuine remorse and described the attack as his "darkest day". 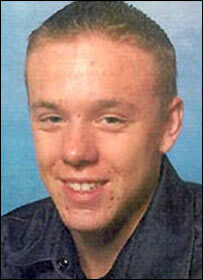 Passing sentence, Mr Justice Leveson said Nathan had been a "fine young man on the threshold of his life", attacked for absolutely no reason, other than he supported a different football team and had the "temerity" to visit a public house the defendant and others believed he should have kept away from. He added football hooliganism was a "scourge on the sport" and said the courts should make it clear that anyone involved in violence would face harsh sentences. The mothers of both the victim and killer broke down in court as CCTV footage of the attack was shown. McNee has also been banned from football matches for ten years - the maximum ban available.